PlayStation has officially announced the free games PlayStation Plus members can expect for the month of November via the PlayStation Blog. The two featured games will be Bulletstorm: Full Clip Edition and Yakuza Kiwami. Also included in the free games for members will be the Jackbox Party Pack 2 and Arkedo Series for PS3, and Burly Men At Sea and Roundabout for PS Vita. 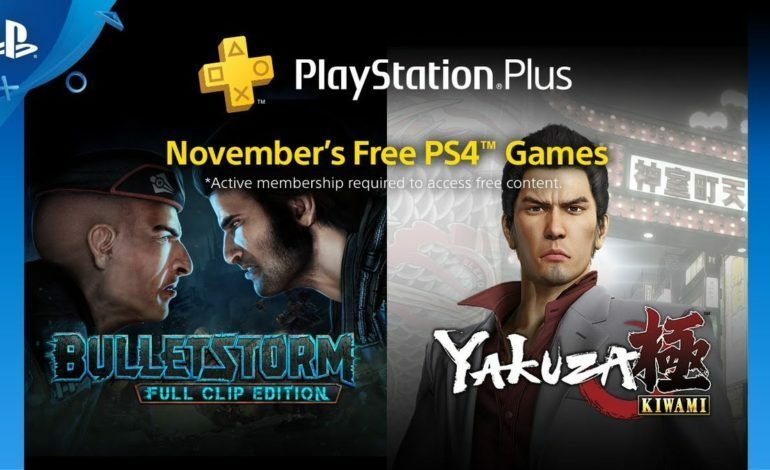 The two headlining games featured this month, Bulletstorm: Full Clip Edition and Yakuza Kiwami, were actually leaked at the beginning of October on the PS Plus page of PlayStation’s website. The post, which was supposed to show the games for October, got taken down shortly after, but not before a good chunk of gamers had the main November games spoiled almost a month early. Bulletstorm: Full Clip Edition, originally released in 2017, is a remastered version of the 2011 Bulletstorm including both DLC packs released for the game. Bulletstorm is a futuristic, over the top first-person shooter with a wise-cracking lead, Grayson Hunt. If you’re a fan of shoot-em-up games with a fair amount of toilet humor, Bulletstorm: Full Clip Edition is the game for you. Yakuza Kiwami is a souped-up remake of the original Yakuza game. Kiwami has taken the original game, added in more story elements, such as new main and side plot lines, and has incorporated elements from the series prequel, Yakuza 0, which was released more than ten years after the original. The remake has also added new game mode “Majima Everywhere” where the main character’s rival shows up randomly and demands a fight. The Yakuza series as a whole is highly acclaimed, and each game released received favorable reviews, so if you’ve yet to get into the series, now is your chance. Also included are PS3 games Jackbox Party Pack 2, a party game where players use their phones or tablets to play along, and Arkedo Series, a collection of three vintage-style arcade games. For PS Vita (with Cross Buy for PS4) are Burly Men At Sea, a choice-based, story-driven adventure about a group of sailors, and Roundabout, a game where you “control” a wildly spinning limo as you drive passengers to their destinations. The free games will be available for download starting Tuesday, November 6 which means that PS Plus subscribers only have a few more days to download the October free games as well.